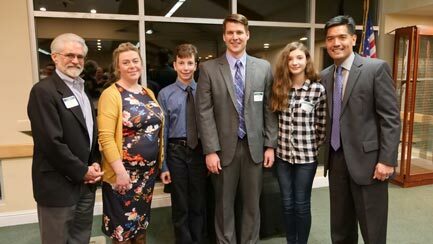 At an awards ceremony on March 5, the El Dorado County School Boards Association (EDCSBA) recognized school board and community members for their 2017 contributions. County Superintendent of Schools, Dr. Ed Manansala, facilitated the presentations and remarked, "Everyone here helps to foster the educational leadership that makes this County such a special place. Thank you and congratulations!" Educational Statesmanship: Todd White, El Dorado Union High School District, is an advocate for public education in the community and was recognized for his efforts towards enriching and improving the educational experience for all students. Leader in Boardsmanship: Winston Pingrey, Buckeye Union School District, was honored for his valuable leadership and strong collaborative skills. To govern effectively, individual board members and the superintendent coalesce to ensure a high-quality education is provided to all students. Outstanding Community Member/Organization: Camino Community Action Committee was presented the award for their notable contribution of time and financial support to education; effective collaboration with education and community leaders; development of innovative solutions to complex challenges facing public education; and active involvement in the community. Dolores Garcia Memorial Spirit of Boardsmanship: Tom Griffin, Pollock Pines Elementary School District, was presented the award for his exemplary leadership, service, and advocacy on behalf of district students, educators, and families. The award was named after Dolores Garcia, a trustee on the El Dorado Union High School District Board from 1975 through 1983, and the El Dorado County Board of Education from 1996 until her passing in 2012. Guest speakers told student and teacher stories of resiliency to demonstrate to those in the room how their work helps to create a culture of community and strength throughout El Dorado County. Speakers included Molly Smith who teaches Leadership at Union Mine High School, Kyle Pellegrini who attends 8th grade at Charter University Prep, Abigail Oberhauser who attends 8th grade at Charter University Prep, and Jared Parker who teaches Special Education at El Dorado High School.